Two by Two Coming to the Goshen Playhouse! 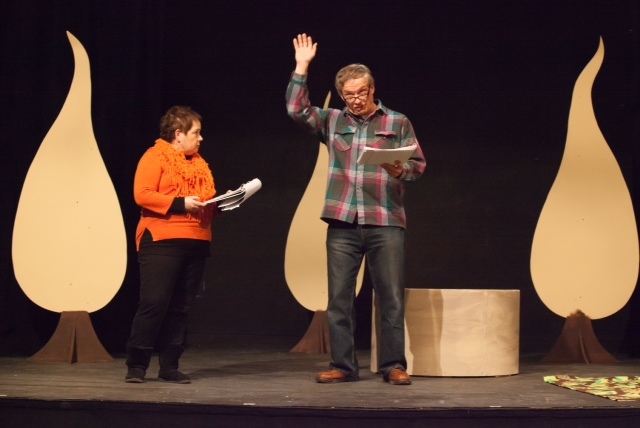 There’s a flood of interest already about the upcoming production of Two By Two by the Goshen Players in Goshen, Connecticut! Based on Clifford Odet’s play “The Flowering Peach”, this show depicts how Noah’s world is turned upside down when he receives instructions from God to build an ark! Rehearsals have been underway as the cast and crew perfect this delightful rendition of a familiar and important story. In the coming weeks, Nutmeg Chatter will feature interviews with some members of the cast and an exclusive behind the scenes look at the work! Enjoy these two “behind the scenes” looks at the rehearsals taken by resident Goshen Players photographer Heather Boscarino! Looks like some great talent in this one.